Pierce Brosnan had never been happier to be out of work. It was spring 1986, and he had received word his NBC sleuth series Remington Steele would not be renewed for a fifth season. After the first two years, he explained to an interviewer, he had pretty much had enough. Four was plenty. And now there was more reason to celebrate its demise: Following a successful screen test, he was the first choice to be Roger Moore’s successor as James Bond. 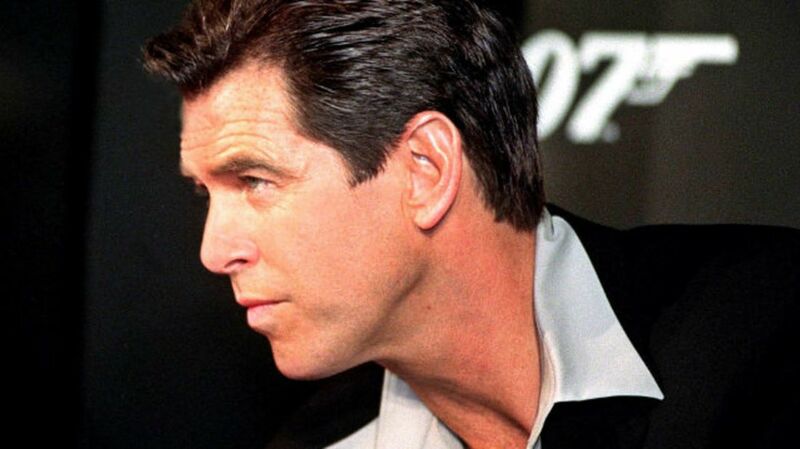 Brosnan’s show was axed in May 1986; shortly thereafter, he was offered the Bond role. The victory lap lasted roughly two months, at which point NBC made the inexplicable decision that Remington Steele wasn’t canceled after all. The search for a new Bond seemed to take a page out of David O. Selznick’s famous campaign to find his Scarlett O’Hara for 1939’s Gone with the Wind. Speculation, information leaks, and other gossip amounted to piles of free publicity. When Roger Moore decided to end his association with the role after 1985’s A View to a Kill, the entertainment press had a field day trying to guess his replacement. Mel Gibson was one name discussed; so was Sam Neill. But longtime Bond producer Albert “Cubby” Broccoli had his sights on Brosnan, who he had first met during filming of 1981’s For Your Eyes Only. Brosnan’s new wife, Cassandra Harris, was playing a Bond girl in the film. They had dinner at Broccoli’s house; Brosnan would also show up on set, where it would be easy for someone to mistake his GQ appearance for Ian Fleming’s spy. “I’m Bond, James Bond,” Brosnan would joke while giving Harris a ride back from shooting. Broccoli, however, took it more seriously. After confirming NBC was canceling the four-year-old Remington Steele owing to stiffer competition on Saturday nights from ABC's Spenser: For Hire, Broccoli began discussing a three-picture deal with the actor that would begin with 1987’s The Living Daylights. There was just one asterisk: NBC had 60 days to essentially reverse course and act upon their right to retain the cast for another season. While contractually permissible, it was considered unlikely. As late as July 13, 1986, NBC president Brandon Tartikoff was telling press the show had already reached its creative peak. Ratings, however, were another story. The series got a boost in summer reruns as a result of the media attention over Brosnan’s casting. Instead of being a lightweight detective show, Steele became a place to check out the new James Bond. Sensing they could capitalize on the attention, Tartikoff decided to order six more episodes as a mid-season replacement for the 1986-1987 season. The network wasn’t oblivious to the problems this created for Brosnan, who had a verbal agreement to do Bond: They offered to have the show relocate to Europe so he could work on both. Broccoli, however, was not agreeable to the idea. In his eyes, the Bond brand couldn’t afford to be diluted by an actor appearing on a weekly television series. Broccoli resented that NBC was capitalizing on the success of his hard work. With just days left before the network option expired that July, Brosnan got the call: Remington Steele was back on. Though he’d shot promotional material for Bond already—including the classic gun-in-air pose—he hadn’t signed the three-picture deal. Broccoli was free to part ways with him, and that's exactly what he did. In the 2012 documentary Everything or Nothing, Brosnan explained how the whole experience left him rattled. NBC ran just six episodes of Remington Steele before canceling it for good, making their intrusion even more senseless. Driving down the Pacific Coast Highway one day in 1987, Brosnan saw billboards of new Bond Timothy Dalton staring back at him. The other guy had gotten it. Dalton’s brooding Bond was a departure from Connery and Moore. After two films and a six-year hiatus owing to MGM’s legal troubles, he and producers parted amicably and the role was recast for 1995’s GoldenEye.